Sooner or later, holes in the ground usually fill with water. That’s why leaky basements are a perennial possibility. The challenge of building reliably dry basements can be pretty simple if you do the right kind of work at the right time during construction or renovations, and if ground conditions are favourable. But the stakes are high, too. Leaks can bust your reputation and business if your basements flood. There are also site conditions where you should do all you can to convince your clients to forget about building a basement in the first place because it’s virtually impossible to prevent leaks, no matter what you do. 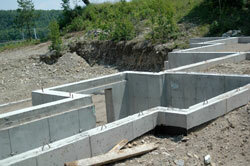 horizontal drainage pathways that allow water to flow away from the lower parts of a basement and footings. There are plenty of dry basements in Canada that don’t have all or even any of these features in place, but why tempt fate? You never really know for sure how a basement will behave just by looking at the site, and that’s why it pays to get all the waterproofing protection you can working on your side early on, creating multiple layers of safety, while diligence is still easy to make happen. There’s no shortage of exterior foundation coatings that claim to help keep basements dry. And while it’s up to you to determine whether or not any particular product actually works, something effective applied to the outside of the basement wall is necessary for the most reliably-dry basements. That’s because all masonry is remarkably porous. Blocks are especially vulnerable because they’re mostly hollow, but even an 8”- or 10”-thick poured wall offers very little resistance to moisture that wants to get in – cracks or no cracks. Vertical drainage membranes offer the single most effective improvement in basement moisture control over the last 20 years, which is especially surprising since they look so ineffective. These dimpled plastic sheets fasten to the outside of masonry foundation walls, leading from soil level at the top, down to weeping tiles at the footing. Seams simply overlap, with the membrane held against the wall with fasteners until backfilled soil does the job permanently. 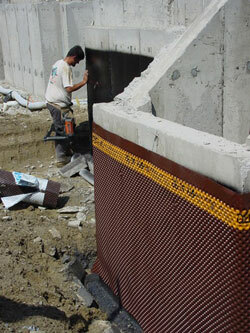 Even though unsealed seams on vertical drainage membranes prevent the installation from being completely waterproof in and of itself, these products go a long way to keep out basement water by greatly reducing soil pressure against the foundation wall. Without soil pressure, water is free to trickle downwards by gravity unimpeded, with no reason to travel horizontally through the foundation wall and into the basement. Keeping water from penetrating foundation walls is one thing, but you need to direct it away from a structure afterwards for a basement to stay dry. 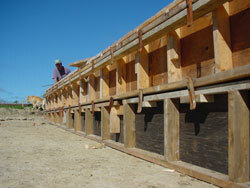 This is the third ingredient required for building reliably dry basements, and it’s where drainage tile comes in. 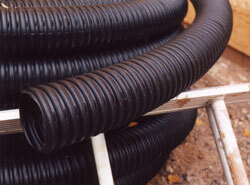 While there’s no secret to how drainage tile should be put in, sloppy installations often cause trouble. Tiles need to be nestled in clean, crushed stone, oriented with a transit and covered with landscape fabric to prevent silt from clogging the passages. You’ve only got one easy shot at building a dry basement, and remedial work is so much more trouble and expense than doing things right the first time. And while success isn’t complicated, results usually boil down to the same old question: Do you care enough about your work and your clients to do a good job, even when nobody’s looking? 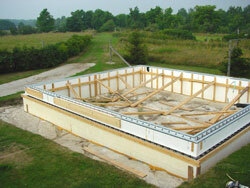 If project plans call for a poured foundation wall, then you’ve got a powerful option for keeping basements dry. That’s where a product called Cementaid can help (905-832-4161). 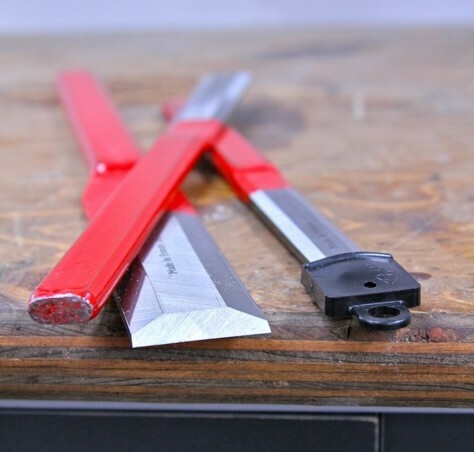 It was developed more than 50 years ago and remains relatively unknown, even after proving that it can make concrete absolutely and completely waterproof. Where conventional concrete mixes are highly porous after they cure, Cementaid makes concrete so structurally waterproof that it’s even been used to make successful roofs. Any sewer can back-up into a basement given the right conditions, but a backwater valve is cheap insurance against nasty surprises. The valve is plumbed into the outgoing drainpipe as it leaves the home, and uses a swiveling gate that allows water to flow one way only. Encouraged by a growing number of municipalities, the $100 price tag of a backwater valve is low enough to make this plumbing feature an important part of any basement construction of renovation campaign. If any of your finished basements depend on a sump pump to prevent ruined floors and walls, then you need to advise your clients to go for more than the regular, plug-in sump pump. 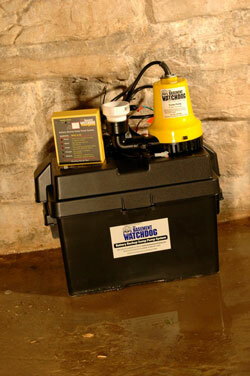 Reliability during a power failure is the reason why, and battery-backup sump pumps are one option. Designed to operate on a 12-volt car battery, these sump pumps are typically installed to kick in at a slightly higher water level than a main sump pump. And though they only operate as long as the battery holds out, the best models can pump quite a bit of water on a single charge — thousands of gallons in fact. 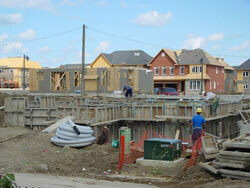 You’ll also find sump pumps that use running municipal water as a power source. The units I’ve looked at use about 1 gallon of water for every 2 gallons pumped, and they only come on if the water level rises above the point where the regular electric sump pump is supposed to kick in. Depending on where you build in Canada, bedrock is something you may never have seen on your jobs, or something you see all the time. And whenever bedrock exists anywhere near a basement, it poses two challenges when it comes to creating reliably dry basements. First, if bedrock is at basement floor level or several feet below, it always prevents downward movement of rain and meltwater, typically forcing water to flow horizontally as it follows whatever slope the bedrock’s got. I know because I’ve seen this in several situations, and no amount of weeping tile, drainage membrane or waterproof coatings are going to keep bedrock-blocked water from moving into a basement. The only effective way around the problem is to create a concrete floor on top of a 6” to 12” layer of coarse and clean crushed stone laced with drainage tile. Draining this underfloor cavity (either with drainage tiles or a sump pump) acknowledges that the water will come in, but keeps it hidden and deals with it out of sight. Second, wherever bedrock is present in a basement, there’s another problem, too. The surface of bedrock is usually cold enough during summer to trigger large and damaging amounts of condensation if warm, humid air is allowed to touch the surface. The rock cools down the air to below the dew point, causing liquid water condensation to develop. Fiber-based insulations can’t prevent this because moisture-laden air simply moves right through it. The only option for preventing bedrock from sweating condensation is by sealing it behind impervious, closed-cell insulation, either spray or sheets.